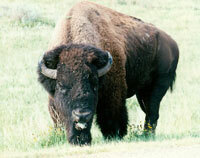 Bison Riding Mountain National Park was established in 1930. The Park covers an area of 3000 sq km and preserves an example of the Manitoba escarpment, which rises 500 meters from the Lowlands. The landscape is a patchwork of shallow lakes, hills, wet meadows, and mixed forests, characteristic of the prairie pothole countryside. Riding Mountain National Park is situated on the west side of the province and is an island of forested parkland in the midst of a sea of agricultural lands. The centre of a Biosphere Reserve, Riding Mountain is one of the most stressed parks in Canada's national park system. Wapusk National Park was established in 1996. It is located along the western shores of Hudson Bay, from the Churchill River, up to near the top of Manitoba and spans 11,475 km2 of tundra, muskeg, lakes and rivers. Wapusk is home to polar bears, woodland caribou, Arctic and red fox, Canada goose, lesser snow goose, swans, and many other species. Wapusk was established with the consent of the affected First Nations, who also sit on the park board. The Park Management Board for Wapusk is in the process of preparing a management plan for the national park. A management plan and a conservation plan are requirements for each national park under the National Parks Act. In summer 2004, the public was invited to comment on a draft management plan for Wapusk. 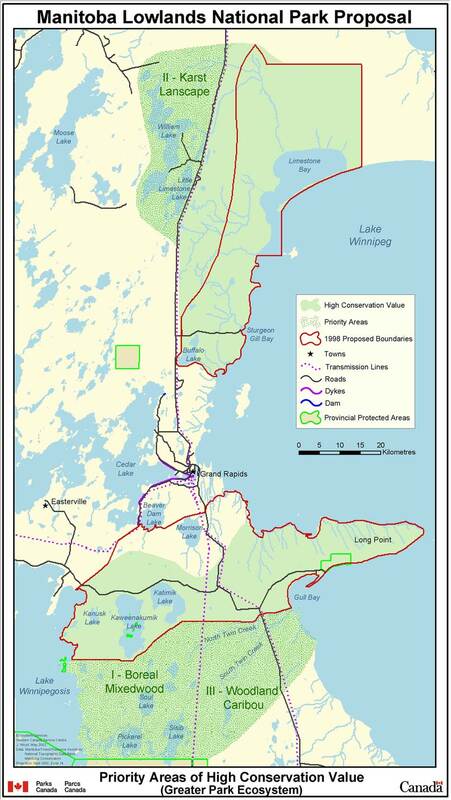 Manitoba Wildlands provided comments on this draft management plan. A third national park is intended for Manitoba. 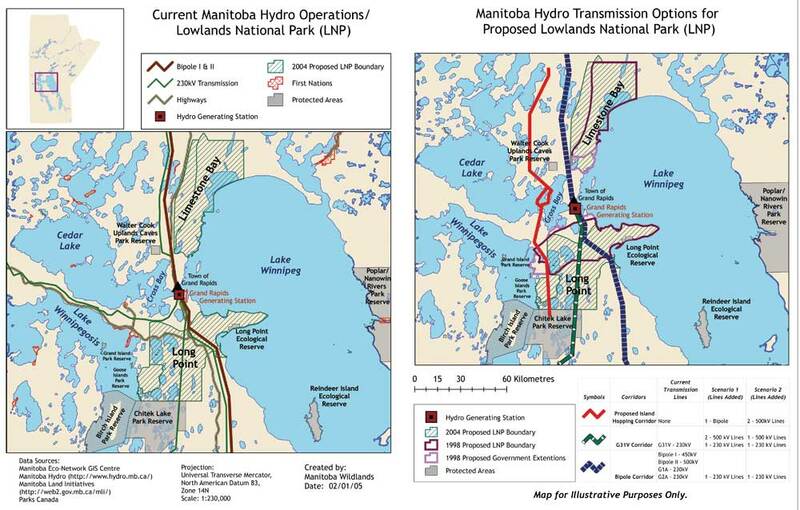 Under discussion since the 1970s, and under study since 1992, the Manitoba Lowlands national park will be located in the lands above Lake Winnipeg and between Lake Winnipeg and Lake Manitoba. Two unconnected areas (dubbed "Long Point" and "Limestone") were identified by governments of Canada and Manitoba as candidates for the national park in 1996. 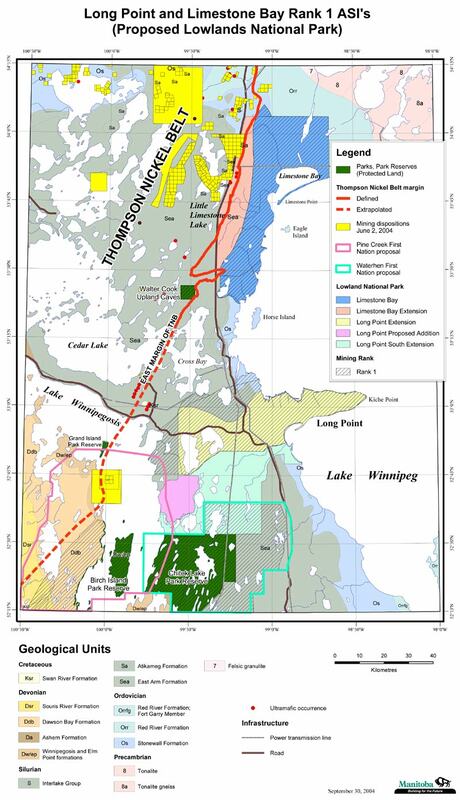 Long Point connects Lake Winnipeg and Lake Winnipegosis. 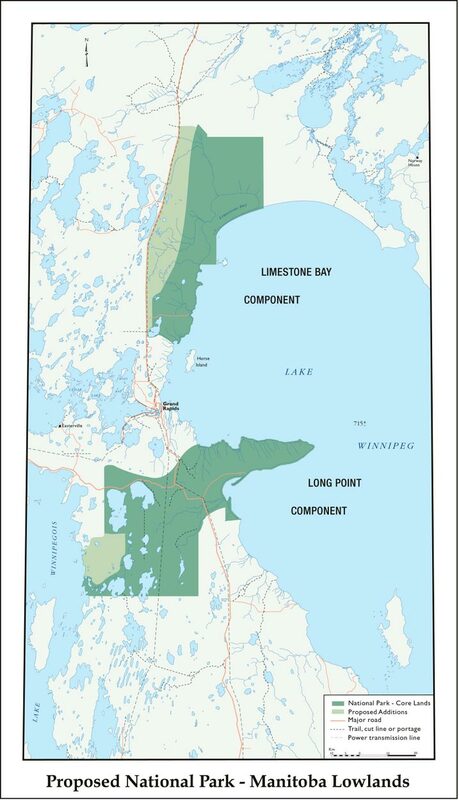 Limestone is at the top of Lake Winnipeg, and includes lands on the west side of Lake Winnipeg going towards Long Point. 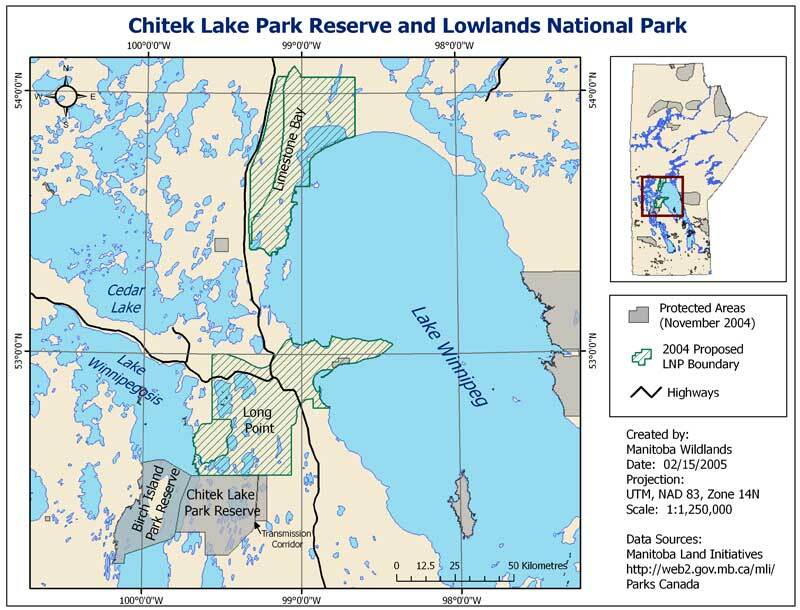 The 2004 potential boundaries include significant mixed boreal forest lands south of Long Point, towards the Chitek Lake Park Reserve. View the Chitek Lake Park Reserve and Lowlands National Park Map February 2005, Manitoba Wildlands. In March 2004, Governments of Manitoba and Canada signed a memorandum of understanding (MOU) to work together to conclude consultations and negotiations for a Lowlands national park establishment agreement by May 2005 (see Manitoba Wildlands news item of March 23, 2004 ). No MOU has been signed with the affected First Nation communities respecting the establishment of the proposed Lowlands National Park. Parks Canada policy is explicit regarding the standards for consultations and respect for Aboriginal rights when establishing a new national park. Manitoba's First Nation protected areas MOU is also explicit about the required steps for decisions to establish new protected areas. In April 2004, Parks Canada released the Parks Canada Corporate Plan 2004 - 2009. The Plan includes references to the establishment of a new national park in Manitoba and states that "Parks Canada will work with the Government of Manitoba to achieve a park establishment agreement by March 2006, and will seek to involve Aboriginal and local communities fully in these negotiations from the outset". The March 2006 date for a park establishment agreement is contrary to the March 23, 2004 MOU between Canada and Manitoba that commits the two governments to complete the national park establishment agreement by May 2005. Watch this page and our News page for continuing updates. Recently Manitoba Wildlands created a new Hydro Research page. 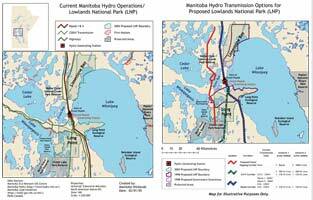 The document Hydropower Transmission in Manitoba - Manitoba Wildlands (January 2005) includes maps that show potential Manitoba Hydro transmission corridors through the Lowlands National Park region and suggested park components. Map and chart with transmission scenarios are provided below. 2005 - Despite the May 2005 end-date in the March 2004 Canada-Manitoba MOU for national park establishment agreement, at the end of May 2005, no announcements have been made regarding either the MOU or the status of consultations and negotiations for a national park. It is not clear whether consultations or negotiations for a national park establishment agreement have even begun, as no information regarding the progress of MOU objectives has been made public since the MOU was signed in 2004. 2007 - June 2007 saw extension of interim protection for Walter Cook Caves Park Reserve (Regulation 80/2007, issued June 15, 2007) and new interim protection for the 4,095 ha Little Limestone Lake Park Reserve (Regulation 94/2007, issued June 15, 2007). Both are in the area of the proposed Lowlands National Park, but outside proposed park boundaries. For more information, visit the Protected Areas Announcements page. - In August 2007, Chief Ovide Mercredi of the Misipawistic Cree Nation at Grand Rapids publicly rejects the idea of a National Park that would include his First Nation's traditional territory because he doesn't trust Parks Canada to protect the lands and prevent Banff-style development for tourists. Instead, the community is exploring creation of a mechanism to enable the Cree to protect and govern in traditional lands (see Manitoba Wildlands' August 22, 2007 news item).